Fumonisins are naturally occurring Mycotoxins produced by Fusarium mold species. Fumonisins contamination happens worldwide in many agricultural commodities, especially in corn, and is usually associated with dry and hot weather followed by periods of high humidity. Out of more than ten types of Fumonisins, Fumonisin FBI is the most prevalent and toxic, followed by Fumonisins FB2 and FB3. Fumonisins are classified as possibly carcinogenic for humans and also cause health problems in animals, especially in equids and swine. FDA sets total Fumonisins limits in human foods between 2-4 ug/g and in animal feed between 5-100 ug/g. Since Fumonisins don't have a chromophore and don't fluoresce derivatization is needed to achieve the required sensitivity of detection. 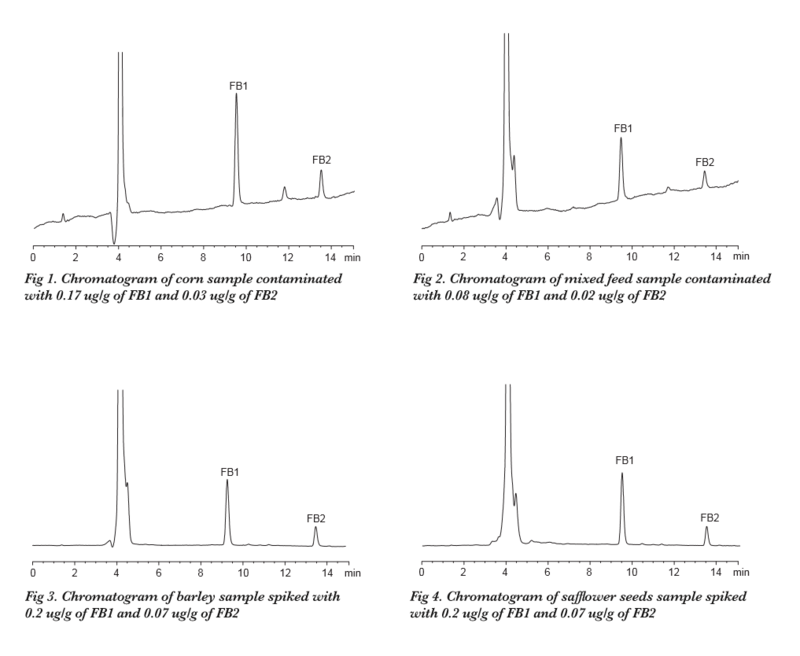 We developed a fast and sensitive HPLC method with post-column derivatization that is capable of analyzing Fumonisins mgrains and animal feed at levels as low as 0.01 ug/g. To 25g of finely ground sample add 2.5g of NaCl and 50 mL of extraction solution. Blend at high speed for 5 min, filter through fluted filter. Take 10mL of extract and add 40 mL of PBS solu­tion, mix well, filter through microfiber filter. Load 10 mL of diluted extract to Immunoaffinity column, let the solution pass through at the flow rate about 1-2 drops/sec. Wash the column with 10 mL of PBS solution, elute with 1 mL of Methanol fol­lowed by 1 mL of DI water. Evaporate the solution to dryness under the stream of Nitrogen, reconstitute in 1 mL of Methanol/ water (50/50). Inject lD–50 uL.